I'm not sure what the "desert ship" in the title refers to : is it an order? is it a reference to the camel? is it a reference to the legends of ships mysteriously ending up in the desert? I wouldn't know. No liner notes to explain it. It's an ambiguity and cleverness that characterizes the music of Satoko Fujii. She and her band are the perfect synthesis of modern music, going beyond jazz, integrating anything from classical over folk and traditional music, with jazz, free improvisation and avant-garde, but then pushing it all over the edge. This enables her to explore composition/improvisation with a musical richness which is given to few. 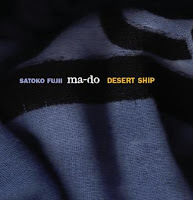 The band is Satoko Fujii on piano, Natsuki Tamura on trumpet, Norikatsu Koreyasu on bass, Akira Horikoshi on drum, in short "Ma-Do", which already released the excellent "Heat Wave" in 2008. She is also a master of contrast, just to give a few examples : putting almost romantic piano musings over a drums going berserk, as on "Sunset In The Desert", or starting a composition with a repetitive piano phrase over which the bass improvises, as on "Ripple Mark", creating some kind of reverse world hegemony, in which things are topsy-turvy. The totally unpredictable compositions, with angular turns, changing rhythms, the juxtaposition of carefully composed and structured elements with wild even violent excursions, the stark contrast of Tamura's sweet trumpet sounds with his unparalleled screaming, it's all here, again, with unrelenting intensity. A wealth of ideas, mood changes, taking the listener by surprise by each listen. Using contrast is one thing, but making it match is another: lyricism blends with noise, harmony with dissonance, impressionism with expressionism, fire with water. It's story-telling time: "While You Were Sleeping", gives an eery picture of awful or menacing things that could happen in the dark outside world, while you are dreaming in peace, or it could be the reverse : the stuff that nightmares are made of : the piano strings that sound like a uncanny gamelan, the trumpet first whispering like a choir of zombies, then howling like the wails of the insane. There is some familiarity to be found, somewhere, buried under the heavy thunder of the chords, the powerful pulse of the bass, the no-holds-barred drumming, which are disconcerting, knocking the listener out of his/her comfort level into the zone of the real listening experience, in which there is no possibility not to listen, not to be part of it. You are part of it, whether you want to or not. The last piece's title, "Vapor Trail" is a good descriptive of the music, which comes as a kind of soothing finale, when catharsis has been reached, a moment of acceptance, of resignation, of awe for the beauty that arises after the violence, the fire has died down, after the sun has set.